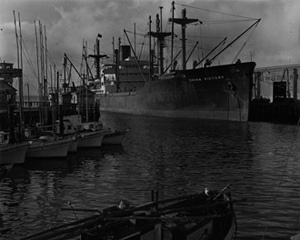 Ship “China Victory” And Fishing Boats, San Francisco Waterfront, San Francisco Bay, California, copyright 1948 by Philip Hyde. The fishing boat hulls on the left are an example of planes parallel to the focal plane. Perhaps one of the most renowned, yet mysterious concepts that Minor White taught was Space Analysis. Few of Minor White’s students gave any indication that they understood the idea completely. Interviews with Philip Hyde, William Heick, Ben Chinn, Stan Zrnich, David Johnson and others bear this out. Little has been written or described anywhere regarding the definition of Minor White’s Space Analysis. Now, here, published for the first time ever are Philip Hyde’s class notes from August 1947 covering Minor White’s lecture on Space Analysis. Composition in the Graphic Arts consists of organization and construction; as contrasted with photography. Composition in photography consists of analysis and organization of existing elements. In photography, the frame of the viewfinder or ground glass isolates or selects elements desired. Implication of horizontal plane (as viewed from above) from Vertical Plane is part of Space Analysis. Arises from conventions, knowledge and due to the third dimensional effect inherent in a photograph. The subject can dictate the organization of the rest of the photograph and the rest of the photograph should conform to the subject. Perhaps the simplest type of subject is one single plane photographed. For example: a wall. Parallel planes in depth—a series of objects without an intervening horizontal plane. For example: a series of stage sets. Sometimes called banding. Horizontal plane with lines of demarcation. For example: waves on the ocean photographed from a high cliff. Vertical lines open the space up a little more. 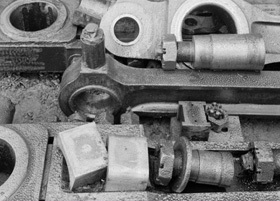 For example: a series of planes in depth with vertical edges. Planes at an angle to the focal plane. Diagonal or Receding Planes. For example: a road going away from the camera. The space between objects or around objects has existence and weight. This volume or space is exceptionally important in photography, as is the control of this space, as effected by the tone of respective objects, lighting of objects and placement of the horizontal plane—in tonal values. For example: Screens are placed near each other; the space between may be expanded or contracted by the control above. The Minarets From Tarn Above Lake Ediza, Minarets Wilderness (now the Ansel Adams Wilderness), Sierra Nevada Mountain Range, California, 1950 by Philip Hyde. This photograph Ansel Adams said he liked better than his own of the Minarets. 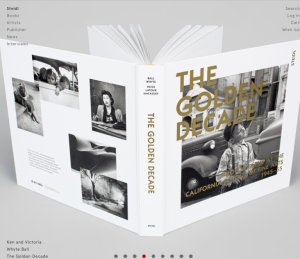 Philip Hyde during and after photography school at the California School of Fine Art was invited by his teachers and mentors, Ansel Adams, Minor White, Edward Weston, Imogen Cunningham and Dorothea Lange to exhibit his photographs with theirs in major exhibitions. He exibited on several occasions with Edward Weston in a two-man show, once with Minor White in a two-man show, and in group shows with members of Group f.64. This photograph of the Minarets was chosen for a number of the exhibitions and now resides in national collections such as the Eastman Kodak House and others. From Group f.64’s beginnings in the San Francisco Bay Area, members dispersed in various directions, setting out to show the world that this “new” form of photography would not only take, it would become the prevailing form. Today in the Twenty-first century people all over the world study the work of the members of Group f.64 and similar greats of the Modern Era, which lasted roughly from 1930 through the 1950s in the United States. In 1940 David McAlpin, a Rockefeller heir and trustee of the Museum of Modern Art in New York, abbreviated MoMA, financed the founding of a department of photography at the museum. A Harvard-trained art historian, MoMA librarian and curator of MoMA’s first photographic exhibition in 1937, Beaumont Newhall was the department’s curator. McAlpin’s gift was contingent on Ansel Adams consenting to be vice-chairman and agreeing to come to New York for six months to advise the launch. Over 500 New Yorkers turned out for the first opening. This was regarded as a large crowd for such an event and Time Magazine asserted that such a department gave photography equal status to painting and sculpture. However, most other press failed to recognize its significance. Philip Hyde was honorably discharged in December 1945 and made it home to San Francisco by Christmas. Philip Hyde briefly met his future wife and life-long traveling companion, Ardis King at a New Year’s Eve Party in San Francisco. They did not see each other again until the Fall of 1946, when Philip Hyde took several classes at the University of California Berkeley through a twist of fate. Ansel Adams taught a one-month course at the California School of Fine Arts in January 1946 and a Summer Session from June 24 through August 2. The first regular semester day class was to start in September 1946. 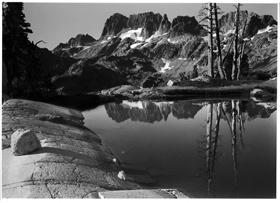 Philip Hyde attended the Summer Session at the California School of Fine Arts instructed by Ansel Adams. Philip Hyde was waiting eagerly for the full-time Fall photography class. However, a surprise was in store. “Nearly 500 students applied to the photography program,” wrote Jeff Gunderson in The Moment of Seeing: Minor White at the California School of Fine Arts . “The capacity of the laboratory facilities limited the number of students to 36.” Philip Hyde had written and applied early but due to some mix-up in his paperwork or confusion over the date of his application, Ansel Adams had to write to let him know that he “headed the waiting list” for the next regular semester day class to start the following Fall 1947. Philip Hyde would have to wait a year to start photography school. He was upset at the time but Minor White suggested it was an opportunity to get some broader education using his G.I. Bill. Philip Hyde applied to U. C. Berkeley and took a design class, a painting class with the famous Japanese painter Chiura Obata and several other classes over two semesters. He also ran across Ardis King again, who was studying for her teaching credential. They eventually were married in June 1947 (More in a future blog post and in the book.) “If it weren’t for the mix-up at CSFA,” Dad said. “I never would have become acquainted with my future wife. Thus the year he waited to go to photography school became one of the happiest years of his life. However, when he joined the second regular class in September 1947, something else had changed.